My motto for this decade is “Learn to teach, and teach to learn”. This applies to people of all ages and backgrounds, from Jupiter, two years old to Frank, ninety. My experience over the last forty years as a massage professional is now complemented by my earlier experience as a filmmaker. This fusion of skills along with the internet and social networks enables me to bring my patients’ real-life tutorials into the intimacy of your home and workplace. My beginnings, massaging my farm animals in the West Kootenays of British Columbia, has continued into work with the SPCA and Humane Society across the country. Recently, I had the joy of producing a mini-series called “Pet Your Pet”. These videos are available on YouTube and The Pet Network. My passion for life’s arrivals and departures is the focus of my work in labour and delivery, as well as with death and dying. Massage provides support for both the spiritual and physical dimensions of life’s natural events. Massage makes you feel better. 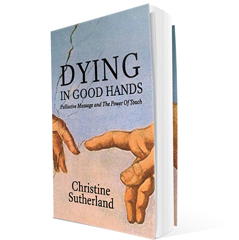 The power of touch has the ability to transform addictions, the events and feelings around the end of life, as well as heal relationships, new, old or recycled. Please click here to see upcoming workshops and events.